Lemme take you on a time travel. Few years ago, the Navigli neighbourhood was what Berliners would call a ‘Kiez’ – an evolved borough full of mom-and-pop shops, Milanese art galleries and the like. No pedestrian zone, no aperitivo frenzy every night, and Italians mostly going after the big brand names when it came to updating their wardrobe. Back then, the arrival of meet2biz must have been like a UFO landing and bringing stuff from outer space – fashion and design items from little unknown tailor’s workshops and design studios. Silvia Bentivoglio, one of the brave co-founders, rolled up her sleeves and helped all these artisanal brands grow and develop the authentic, special, up-quality and unconventional items you can find in the meet2biz concept store. The shop itself is a beautiful reflection of this philosophy – a loft-style ex-architectural studio making you feel more like entering a salon than a brick-and-mortar store. The vintage furniture, the fashion and design pieces on sale match each other so perfectly that entering for the first time I immediately felt embraced by the place’s heart and soul. Add the warm, welcoming passionate character of Silvia, and fashion shopping feels like taking a break from daily life. 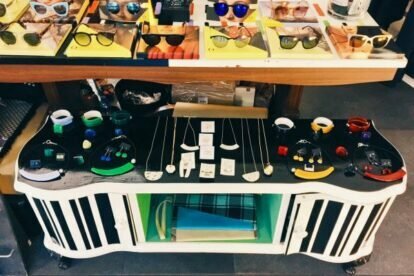 Clocks made from vinyl discs, covers for your mobile buddies, meet2biz‘s own fashion line (produced in Toscana by a company also working for Prada, Armani and Gucci), vintage sunglasses – these are only some of the facets of a bright, colourful, well-curated kaleidoscope of good design. Come see for yourself!